Making the change from a high school of 800 students to a university of 40,000 undergraduates was one of most difficult transitions of my life so far. At first, I was not only daunted of the classes I have to take for my major, Biochemistry, but also by Freshmen Research Initiative. I was an only a freshmen and all I’ve ever known is that either graduate students do research to earn PhDs or scientists do research for their career. I didn’t realize how wrong I was. DIY Diagnostics was my first choice for my lab. I was so excited when I heard about it, especially since I am Pre-Medical student and diagnostic inventions go hand in hand with medical practices. When I first begun the lab, I was able to sample Waller Creek (as shown below). At first, I wasn’t even remotely excited about it. I’ve never been a fan of water, especially mosquito infested runoff water at the bottom of a large university. Then I went to sample the creek with a fellow research person because we were encouraged to never work alone on a project; it was amazing. Finding the points at which we were supposed to sample the river were like mini science scavenger hunts. Subsequently actually scaling down those rocky hills and maneuvering around the overgrown foliage was an feat, and I am still proud of myself. When we got back into the lab, we were slightly winded from the trek and took a small break after placing our samples in the lab. 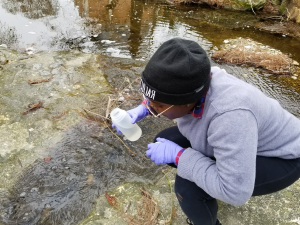 What made the experience even more rewarding were the results of our data; we found a major pipeline leading to pollution within the river and the pollution was significant enough that our lab was able to contact Environmental Health and Safety. So clearly, DIY Diagnostics is making strides within the medical community, but also being able to improve the environment is just icing on the cake. I have also learned skills that I didn’t expect to have knowledge about, such as learning a computer science language in order to code an app through github. I was also able to stay over the summer in the lab for 20 hours a week in order to work on a paper based microfluidic device in order to detect C-Reactive Protein with a team of stellar researchers. From just my 1 year in FRI, I can conclude that DIY Diagnostics has been one of the best opportunities I have had the privilege of participating in because of the research I have done and because of the people I have met.